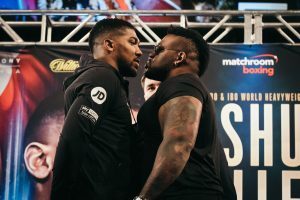 Jarrell “Big Baby” Miller decided sportsmanship wasn’t his thing at Tuesday’s presser to kick off his June 1st heavyweight title fight against Anthony Joshua at Madison Square Garden. No sooner were the two men face to face, than Brooklyn’s Miller gave the champion a hard shove. Joshua, for the moment at least, was cool as ice, as is generally his way. Overall, however, the presser was a mutually hostile affair which, while being good for business, also led some to feel there is genuine dislike between the two undefeated hitters. Joshua, clearly the more easy going of the two men, even got wrapped up in the moment. This will be the first time Joshua has fought in the United States. An enormous attraction in his homeland, Joshua – along with promoter Eddie Hearn – is hoping to extend this superstardom to the United States, where the heavyweight champion of the world hasn’t been a well known figure in years. The Joshua-Hearn battle will be aired live on the DAZN streaming service.